Although numerous “popular committee” forces took up arms in support of the Syrian government in the wake of the 2011 uprising, they were not consolidated into the “National Defence Forces” (NDF, Quwat al-Difaa al-Watani) until the summer of 2012. Previously, these popular committee forces fought in their own local areas, sometimes alongside Syrian military units and sometimes as their own isolated force.1.Lund, Aron. “The Non-State Militant Landscape in Syria” Combating Terrorism Center Fearing fragmentation of their already beleaguered security apparatus, Syrian military commanders quickly established an overarching command structure that absorbed local defense units into the NDF organisation and provided them with supplies, payment, and training.2.Lund, Aron. “The Non-State Militant Landscape in Syria” Combating Terrorism Center Thus, the NDF was created, though the group did not begin to take part in major military operations until mid-2013. The NDF has persisted throughout the Syrian conflict and continues to be semi-active on various fronts throughout the country. Ever since their incorporation, an official NDF media arm has produced photographic reports and video footage through its official social media channels. This article will aim to provide a detailed analysis of the footage produced by this official media arm, beginning with its inception and leading up to the present day, with the intent of answering several questions about the state of NDF media and how it has changed over the years. Initially, NDF units operated alongside Syrian Arab Army (SAA) forces as auxiliaries, meant to augment dedicated offensive units with additional bodies and fire support. As casualties within SAA ranks mounted and as the government began to go on the offensive following the victory at al-Qusayr, NDF units began to play a larger role in the conflict. The success at al-Qusayr, which yielded the regime access to the highway linking Homs to Damascus and secured numerous routes into Lebanon for Hezbollah forces, provided the government with an opportunity to strike back at opposition forces after months of fighting on the defensive.3.“Syria conflict: Qusair’s strategic importance” : BBC No longer relegated to auxiliary positions, NDF battalions began to take part in operations of ever-increasing scale, and even began to launch their own offensives.4.Kozak, Christopher. “The Regime’s Military Capabilities: Part 1” Institute for the Study of War (May 2015) This shift in battlefield dynamics is reflected in the fact that the official NDF media arm did not seriously publish footage until the last months of 2013. Why has this happened? Why is footage no longer being published on a semi-regular basis, as seen previously? What consequences for the NDF are insinuated by this significant change in publication trends? These questions and others may potentially find answers in the following analysis of content and patterns in the body of official NDF footage published between 2014 and 2018. Information about the footage has been collected into a database, carefully reviewed, and analysed by the author over the course of a few months of work. Videos were randomly selected from the vast body of NDF footage published on their official Youtube channel, with the end result being 517 videos – out of a published total of 1,250 – being archived and reviewed. A couple of these were taken from Liveleak early in the process, due to concerns about the NDF channel being taken down from Youtube. Below is an example of how the videos were archived and organised. For each piece of footage, the video’s original title was noted and it was given a transcript whose title included information about the publisher as well as the date of publication. Details such as video length, the location of filming, details of physical terrain, number of light and heavy vehicles present, as well as number of visible instances of combatant death were all recorded during the review process. The videos were also subdivided by “type”, based on the kind of content present in each piece. These “type” categories, such as “Combat” or “Society”, were each built on definitions determined by the author, and videos could fall into two or more different categories. The types of vehicles and weapons present in each piece of footage were also noted, though at times it was difficult to determine what was present due to obscuring factors (poor video quality, distance, dust/smoke, etc.). Common weapons, such as AK-47s/AKMs or M-16 rifles, were not noted due to their presence in almost every piece of uploaded footage. This analysis will go year by year, providing insights into the data gathered and showing trends throughout the course of the war as they make themselves apparent. Unique details and meta-patterns not directly shown in the footage will also be discussed, when relevant. 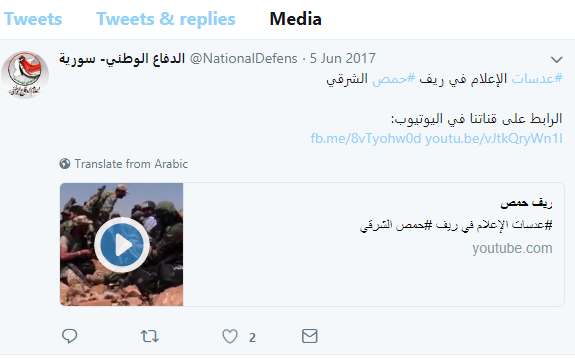 The publication of video footage on the NDF official Youtube channel began on 15 August, 2013, with a propaganda piece entitled “الدفاع الوطني رديفاً للجيش العربي السوري”. Although the organization’s media production got off to a fairly late start, 62 total videos were produced throughout the rest of the year, for a total of 3 hours, 34 minutes, and 45 seconds of footage. The majority of these videos, 38 (61%), were filmed in the environs of Damascus, with the runner-up being Aleppo Province with 12 (20%) videos. A limited number of videos were filmed in rural Homs and Hama, further away from either city center. The 2013 publications immediately established that graphic imagery is an acceptable facet of NDF footage, as 61 images of deaths or dead bodies were dispersed throughout 11 videos. The worst offender is a video from Deir Atiyah published on 1 December, simply entitled “تحرير دير عطية”, that shows at least 13 dead rebels in captured fortifications around that town. The amount of vehicles and weapons seen is, surprisingly, comparable to later years, which is unexpected given the relative lack of footage from 2013. Throughout 62 individual pieces of footage, a total of 193 “light vehicles” show up (light vehicles defined as unarmored, lightly-armed military vehicles such as technicals or small UAVs), an average of 3.11 per video. With regards to heavier equipment (such as tanks, aircraft, artillery, or armored infantry carriers like the BMP-1), the average is expected to be smaller in general, and for 2013 the total number of heavy vehicles spotted is 108, or an average 1.74 per video. NDF fighters advance along the Khanasir-Ithriya Road in late 2013, demining and securing the region. The focus on Damascus is unsurprising given the magnitude of operations performed in areas like Adra, Harasta, Jobar, and outlying towns. As the government struggled to reassert its control over East Ghouta and surrounding areas, the NDF seemed to have played a major part in ground operations alongside SAA and Hezbollah units. The Aleppo province saw significant NDF representation thanks to their role in operations in urban Khalidiyah as well as the operation to re-open the road between Ithriya and Khanasir. Their presence in other governorates throughout 2013, at least in terms of footage, appears to be negligible. 6 videos from Homs, 3 from Hama, and 1 from Suwayda suggest that NDF outfits in these areas took on limited roles during the second half of the year. The NDF Youtube channel was significantly more active in 2014, and produced footage consistently throughout the entire year as NDF outfits appeared to expand their operations across the country. A total of 153 of the archived videos were produced from 2 January to 30 December, 2014, with a total footage length of 7:42:12. A significant number of these videos were filmed in Damascus, totaling 56 videos (37% of footage) while Homs and Latakia saw significant representation in the 2014 footage owing to widening operations in those governorates. 25 of the videos (16%) were from Homs, while Latakia was featured in 29 (19%) videos. Aleppo (10 videos) had less representation, while Hama (8 videos) had slightly more than the previous year. 2014 was by far the worst for graphic imagery, with an astounding 140 images of death dispersed throughout 15 videos. Much of this can be accounted for by the prominence of propaganda pieces, which often consisted film taken from across Syria, and which presented numerous destroyed vehicles and dead rebel fighters as proof of government successes across the country. One of these propaganda videos showed 50 dead rebels seen throughout Damascus; in one scene, the bodies are piled so thick that counting the individual dead becomes virtually impossible. Light vehicles are, on average, shown less prominently throughout 2014, though this can possibly be attributed to the greater amount of videos. 337 light vehicles were counted throughout the body of footage published in 2014, yielding an average of 2.20 per video. However, heavy equipment shows more prominently, as 288 heavy vehicles were counted, yielding an average of 1.88 per video, a significant jump from 2013. This can likely be attributed to the greater offensive role played by the NDF in several theatres. NDF fighters in action near al-Zara, Homs, one of the first major offensives spearheaded by the NDF. The upward trends can not only be attributed to the fact that NDF footage was being published throughout the year, but also to the fact that NDF outfits began to embark on their own offensives, spearheading operations while SAA and Hezbollah units supported. While operations were usually the other way around, the NDF began taking on a larger role in the conflict by spearheading significant offensives as the al-Zara/al-Husn campaign, the operations in Latakia, and the campaign around al-Salamiyah. 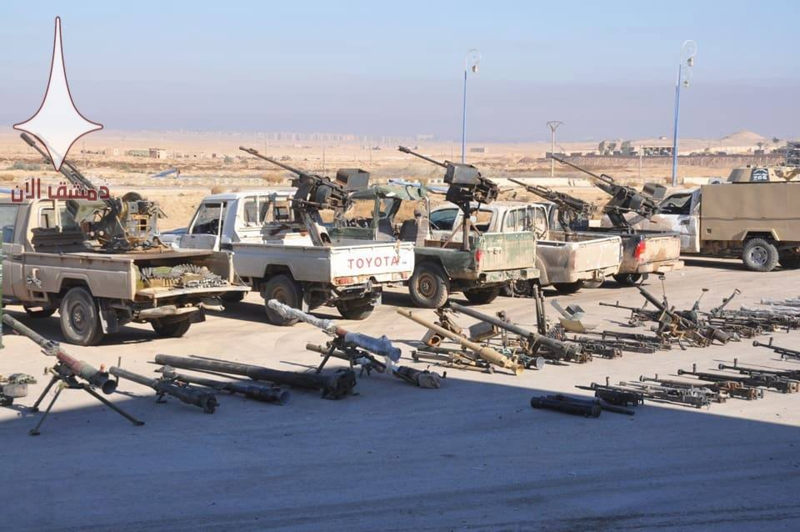 With heavy weapons and armor and the support of the Syrian Arab Air Force (SyAAF), the NDF’s frontline role grew across the country, although the most notable operations of theirs occurred in Homs and Latakia during this year. The larger number of heavy vehicles present, as well as the presence of more advanced equipment such as the T-72 and the BM-21 Grad, speaks to this increased frontline role, as the NDF was handed more responsibility by Damascus. 2014 was the most active year for the NDF media arm, and the downward trend begins with 2015. The NDF’s official media arm produced less content throughout 2015, dropping to 138 videos published. It is important to keep in mind that while these videos were randomly selected, the system used to randomly select them was designed to represent the output of a single year as best as possible. Therefore, there is clearly a decrease in the amount of media being put out in 2015, and other interesting trends can be seen as well. For the first time since 2013, Damascus is not the focus of the year’s footage; rather, Latakia is, dominating the total footage with 44 videos (31%). The vast majority of these videos were filmed in the vicinity of Salma or its northern environs, suggesting that the offensive on the mountain town was spearheaded by NDF units. While Damascus is still significantly represented, with 25 videos (18%), it is overtaken by Hama, at 32 videos (23%). Daraa (9 videos), Idlib (8 videos), and Aleppo (6 videos) all have limited representation, as the focus has been shifted elsewhere. Overall, vehicle counts fall, with 272 light vehicles (1.97 per video) and 167 heavy vehicles (1.21 per video) seen throughout the footage. Despite the decrease in equipment shown, some more advanced equipment and weapons systems show up in the footage. Russian aircraft and equipment in particular, including the TOS-1A and the Su-34 attack aircraft, are seen in limited numbers, primarily in Latakia (with one count in Hama). Graphic imagery had been severely cut back, with only 31 images of death or corpses dispersed throughout 11 videos. NDF fighters advance towards the town of Salma in late 2015. The NDF’s presence in Latakia operations throughout the year was extremely visible. It is difficult to say “why” these trends occurred as they do. In part, the increased focus on Latakia and Hama can be owed to the fact that NDF forces played in offensives in these governorates. 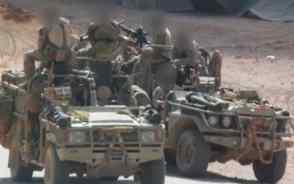 It seems that the NDF continued to be prominent in offensive operations, even as some units remained behind in captured territory to hold down checkpoints and search for hidden munitions caches, with the best example of an NDF-led operation being the campaign to take Salma. For the most part, however, these trends continue into 2016. Although 2016 was an incredibly active year for some parts of the country, while other areas saw reduced action. The downward trend of videos being produced by the NDF media arm continues, as only 107 videos were archived from 2016. Hama was prominent once more, and with 23 videos (21%) was the most represented governorate. Damascus falls slightly behind at 21 videos (19%), with Aleppo (17 videos) and Latakia (18 videos) virtually represented at the same rate. Daraa and Homs also have a few videos published from their rural areas, but their presence is negligible in comparison. The light vehicle count rises significantly while the heavy vehicle count rises slightly. 345 total light vehicles are counted (3.22 per video), whereas a slightly increased number of 152 heavy vehicles (1.42 per video) is counted. Graphic imagery decreases again to a new low: only 17 images of death or bodies were counted in 2016, dispersed over 7 videos. The video with the most graphic images isn’t even from Aleppo, an incredibly active battlefield in the second half of the year, but from a rural region of eastern Hama. 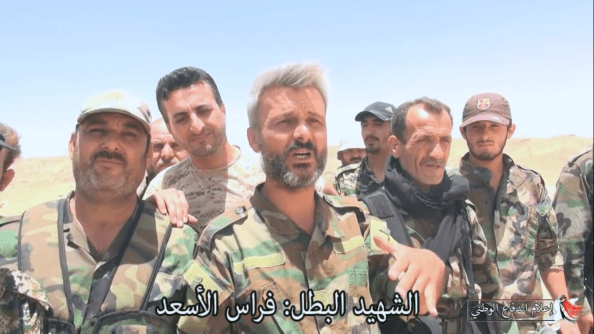 NDF fighters in al-Sha’er Gas Field are interviewed in a video titled “إهداء لشهداء الدفاع الوطني في حقل الشاعر”. It is in 2016 that the NDF’s presence begins to see a significant drop, as fewer videos were published, video runtime on average decreases, and instances of graphic imagery fall sharply. Though it is true that the presence of vehicle imagery increases, the videos with the most vehicles are out of the Hama and Aleppo fronts where other government military elements were active. While it’s not out of the question that the heavy armor and weaponry shown in these videos is in the hands of NDF elements, it is also entirely possible that this equipment belongs to the SAA, Hezbollah, or other Damascus-affiliated militias. Given the lack of identifying emblems or flags on most vehicles, it is impossible to tell. However, it is clear that less footage is being published by the end of 2016, and other downward trends point towards the NDF having a less active role on the battlefield. 2017 is unique in that the quantity of videos archived drops off severely in the second half of the year, and is reduced in general. Of 64 archived videos, nearly 75% of these were published before July, and after July the publication rhythm is severely affected. The total archived footage from 2017 barely tallies over two and a half hours, and most fronts are not represented. The exception is eastern Homs and Hama, where operations against IS grew in intensity and expanded in geographical magnitude throughout the year. Furthermore, in 2018, only a single video has been published by the official channel. This is not even a case of misrepresentation in the scheme of random selection. The channel has literally only published a single video, in February, a commemoration of one of the group’s martyrs entitled “الشهيد البطل الرائد: علاء ناصيف“. 2018’s lack of published footage is even more interesting considering the number of major operations that occurred throughout the country. The Euphrates operation against IS, the Abu al-Duhour offensive, and the recent “Damascus Steel” operation in East Ghouta all yielded significant material and territorial gains for the government.7.Images from a captured IS military supply warehouse in al-Mayadin show the amount of material yielded to the government.8.https://twitter.com/QalaatAlMudiq/status/9551735612950814729.https://twitter.com/AlSuraEnglish/status/985851082185175040 The seizure of East Ghouta, in particular, is arguably the government’s most significant victory since the full capture of Aleppo in December 2016. Interior, native Syrian media channels (SANA, al-Ikhbariyah, Dimashq Alan) as well as external, foreign channels (ANNA News, RT, al-Mayadin) have all consistently trumped up the victory in East Ghouta and reported heavily on the operation.10.“بعد رضوخ الإرهابيين… السوريون مؤمنون بقدرة جيشهم على تحقيق النصر الكامل-فيديو” : SANA11.https://www.youtube.com/watch?v=VzDq39BR6Os12.“Operation Damascus Steel: Syrian Army’s Liberation of E Ghouta Almost Complete” : Sputnik News Why is the NDF an exception to this trend? Their silence could be the result of several factors. The first potential answer to this question is that the NDF’s presence on the battlefield has, in general, decreased since 2015. The decreased rate of video production, coupled with other trends (fewer videos with combat elements, more deployment to less active zones) supports this theory to some degree. Throughout 2014 and 2015, it is clear that the NDF was extremely active on multiple fronts, leading offensives and supporting the military in battles throughout the country. The support role may have continued, but it is feasible that the NDF was removed from its “leading role” and instead returned by military command to the auxiliary role it was initially designed for. The NDF has not vanished from the battlefield entirely, as both native and foreign news outlets continually claim that NDF forces participate in battles. However, while it’s possible that they no longer lead offensives and that their presence has been reduced, why wouldn’t they still publish footage from the fronts they’re active on? Why aren’t they publishing footage at all? A more sufficient answer to the question would be that the official media arm has either lost critical personnel for the production of videos, or has had resources and funding pulled from it. The NDF’s media channels are not connected to the government in any way other than by virtue of being part of a militia network associated with the army – in other words, they are not like the Syrian Arab News Agency (SANA), which is the official national news agency in Syria and is linked to the Ministry of Information.13.SANA’s official profile. While the NDF continues to operate fairly independent of the central government even as it has become integrated into the Syrian state security apparatus, it is not without oversight from Damascus.14.Zambelis, Chris. “Institutionalized ‘Warlordism’: Syria’s National Defense Force” The Jamestown Foundation (24 March 2017) The NDF is portrayed as a “vehicle of national service” and as such is puppeted to some degree by the intelligence apparatus within Damascus, which decides how the organisation will operate on a meta-scale.15.Zambelis, Chris. “Institutionalized ‘Warlordism’: Syria’s National Defense Force” The Jamestown Foundation (24 March 2017) Some individuals within this apparatus may have determined that an independent NDF media arm was a liability, for any number of reasons, and as such pulled the plug on it in order to eliminate the channel. And while the NDF’s official Twitter account remains active, the last time that it posted a piece of media – video or otherwise – was in June of 2017, right around the same time that media production dropped off.16.https://i.imgur.com/3iL9zrP.png The NDF’s official Facebook page continues to show pictures and videos, but many of these are submitted by local outfits, and are not produced by the main publication outlet. Thus, we have evidence that some force moved to shut down the NDF’s media production channels in the summer of 2017. Some additional background evidence to what has already been shown comes in the form of a briefing produced by the Syrian Ministry of Communication in early 2016, called “Workshop on Combating Information Crime”.17.Syrian Ministry of Communications brief The briefing refers to an amendment to general telecommunications law passed in 2012, which provided the Ministry of Justice with a barebones framework for combating cyber-crime and preventing digital theft in Syria.18.2010 Syria Telecommunications Law text However, the briefing also mentions the need to “regulate network communication”, which can be insinuated as establishing precedence for greater controls over social media throughout Syria.19.Syrian Ministry of Communications brief Social media in Syria has previously caused problems for the Syrian military as well as Russian forces deployed there.20.“Russian military bans selfies to prevent soldiers revealing locations” : The Independent It may very likely be in the interest of Damascus to make their military media as centralised as possible, as to be able to regulate what is produced in the interest of preventing public relations issues or prevent the leaking of sensitive data. While the full reasoning for the dissolution and degradation of the NDF media network remains unclear, it is entirely possible that someone in Damascus pulled the plug on the channel for a number of reasons. It remains to be seen whether or not the channel returns to life, but in the mean time, the Syrian conflict has begun to wind down and such an official channel may no longer be necessary. 7. ↑ Images from a captured IS military supply warehouse in al-Mayadin show the amount of material yielded to the government. 13. ↑ SANA’s official profile.